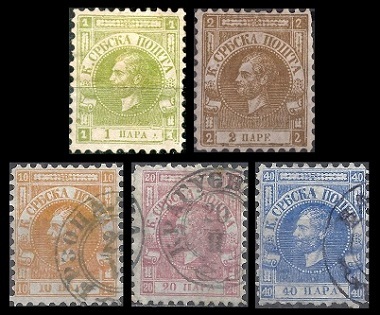 Definitive Serbia stamps first appeared in 1866. This was a crucial time in Serbian history. Serbia had been a semi-independent principality within the Ottoman Empire since 1804. They expelled the last of the Ottoman troops from their territory and declared their independence from the Ottoman Empire in 1867. By the treaty of Berlin, in 1878, the international community formally recognized the independence of the Principality of Serbia, and Serbia became a constitutional monarchy in 1882. The geographical area that we know today as Serbia has played a significant role in World history for over 2,500 years! During the Roman Republic and the Roman Empire, this area, at one time or the other, has been part of the Ancient Roman provinces of Illyricum, Moesia, Pannonia, Praevalitana, Dalmatia, Dacia, and Macedonia. Sirmium (Sremska Mitrovica, Serbia) the capital of the Province of Pannonia, with a population of 100,000, was one of the principal cities of the Roman Empire. In A.D. 294, the city was declared one of the four capitals of the Roman Empire. Seventeen Roman Emperors were born in the area of modern-day Serbia, with ten of them having been born in Sirmium, a number that is only surpassed by contemporary Italy! The most significant of these emperors was Constantine the Great (Lived: 272-337, Ruled: 306-337), the first Christian emperor, who was born in Naissus (Niš, Serbia) in the Province of Moesia. Definitive Serbia stamps of the late 19th Century definitely wouldn't win any philatelic "beauty contest", however, they do offer possibilities for philatelic specialization. There are paper, printing, and sepration varieties on many of the stamps issued between 1866 and 1904. The Serbian stamps presented in this website category will include the postage stamps issued before 1920 and possibly the postage stamps issued from 2003 onward. The postage stamps issued between 1920 and 2003 will be presented in the Yugoslavia website category eventually. Most of the modern Serbia stamps, issued from 2003 to the present day, have a beautiful "antique" ambiance to them, and a complete collection can be formed for a modest investment. And with almost 2,500 years of history and culture to celebrate, the thematic range of the subjects presented on modern Serbia stamps is incredible. 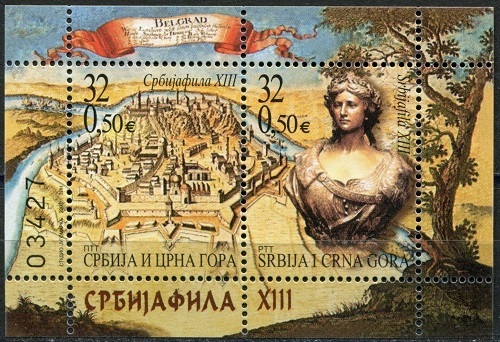 Links to historical articles and reviews of many of the classical and some of the modern Serbian stamps will eventually appear at the top of the third column of this page.